Is there a bad smell coming from your fireplace? Chances are, your house has Stinky Fireplace Syndrome. It's a common malady in warmer weather. Here are some possible causes and how to fix them. Skip the Article and Get Help Now! It doesn't matter what kind of appliance you have, wood, pellet or gas, you will still get creosote deposits in your chimney. If you use your fireplace, there will be a buildup of creosote and soot which causes an unpleasant odor to emanate from the fireplace under the right conditions. Not only is this substance noxious, it can be dangerous if left untreated. Creosote buildup is the leading cause of fireplace odor and chimney fires. We are a professional chimney services company, but we aren't saying this just to get more business: Chimney sweep logs, do-it-yourself sweeping and deodorants are no substitute for a qualified chimney sweep. The International Residence Code and Chimney & Fireplace Fire Code NFPA 211 require an annual inspection and cleaning. If you have skipped an inspection & cleaning, you are not only allowing stinky deposits to build up, you are literally playing with fire. 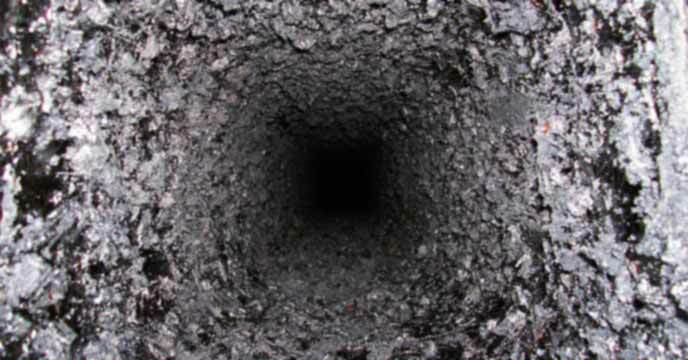 Contact your local chimney sweep for a thorough inspection and cleaning if you are overdue. The flow of gases whether upward or downward through your chimney is determined by draft. Draft is the pressure difference between the inside of your home and the outside. There are many causes of negative draft which results in a reversal of flow, or downdraft, in your chimney. Common causes include temperature differential, over or under energy-efficient homes, stack effect, obstructions and improper heating system sizing. The most common cause is the temperature differential in the outside and inside air of your home. Hot air flows upwards and creates a positive draft in the winter, this is reversed in the summer. Flow reversal is very common in the summertime leading to Stinky Fireplace Syndrome as air flows down the chimney into the house. Make sure your damper is closed. This may be enough to slow the flow of air down your chimney enough to mitigate the smell. Reduce negative pressure in your home. Shut your windows, close all dampers in any other fireplaces and shut off any other places where air may be escaping the house. If the smell is stronger when running your dryer or attic fan, contact your local chimney expert for help. If you still have downdraft problems after trying these two solutions, contact your local chimney service professional for an evaluation. Even thoroughly swept and cleaned chimnies and fireplaces have a small amount creosote deposits left in the nooks and crannies. After cleaning, the minute amount of deposits leftover may be far less than what would cause a chimney fire or stink in a well-maintained heating system, but any used chimney will stink if exposed to leaks and moisture. If your heating system has not been swept recently or is old and has embedded deposits in the masonry, the effect is magnified tremendously. When moisture and/or water combines with creosote it creates sulfuric acid. Not only does the acid stink, it is a serious health hazard and should not be ignored. Moisture also contributes to the Stinky Fireplace smell and allows dangerous bacteria, mold and mildew to grow. The result is a dangerous cocktail of nastiness that should not be in your home. Not only is this cocktail a health hazard, it can cause serious damage to the underlying structure of your home without your knowledge costing you thousands of dollars in repairs. Special Note: A leaking chimney can pose serious health risks to you and your family, it needs to be stopped yesterday! Leaking chimneys are a much greater health risk than water damage to other areas of the home. Often people have undiagnosed health problems as a result of leaking chimneys and don't find out until after the fact. Don't be a statistic. If you suspect your chimney is leaking, contact your local chimney services professional immediately! There are many points where water and moisture can enter your chimney and the problem needs to be evaluated by an expert. Contact a qualified and certified chimney professional to diagnose the cause of your leak and get repairs done as soon as possible. Improper sizing or installation of the components of your heating system can cause flow reversal and excessive creosote buildup in your chimney and fireplace. This is often the case in older or improperly installed appliances. Examples of improperly sized heating components can include chimneys which are too short, causing stack effect where your home acts as a chimney and has more updraft than your chimney itself, oversized fireplace openings which allow smoke and vapors to exhaust into the house, choke points or undersized flues which restrict the flow of smoke and air out of the chimney, appliances too large for the fireplace, (which are a fire hazard) and improper clearances etc. The list is long. There are rules and regulations created for your heating system no matter what type it is; wood, gas, pellet, masonry, manufactured, unlisted etc. Each and every one of these rules and regulations were created because there was a problem in the past that led to inefficiency or a home fire. Only a properly trained and certified technician educated in fire code standards and best practices can diagnose whether your heating system components are sized correctly. Each heating system is different and requires proper training to determine the cause of Stinky Fireplace Syndrome if the cause is due to inadequate components. If you have eliminated causes 1-3, contact a certified local chimney professional for help diagnosing the problem. Contact us today to have one of our trained and certified technicians evaluate the source of your problem and identify solutions.